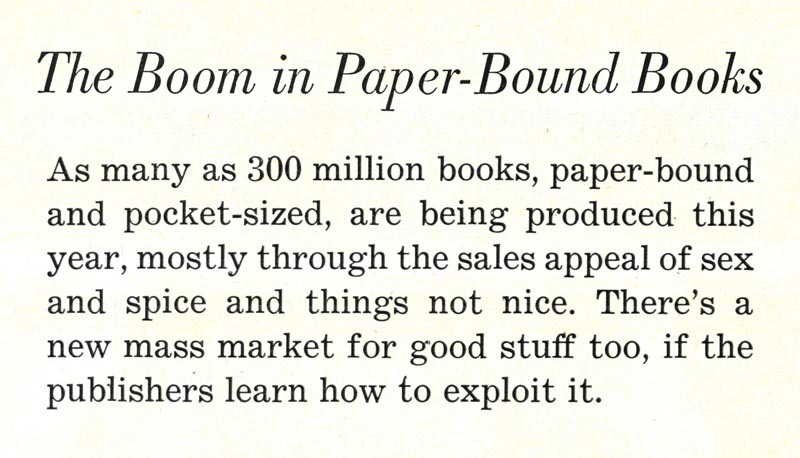 Today's Inspiration: The Rise of the "Paper-Bounds"
The Rise of the "Paper-Bounds"
A September 1953 article in Fortune magazine begins, "The old and gently bred book-publishing business has exploded into the U.S.'s newest mass-marketing phenomenon: the pocket-sized paper-bound. In more than a 100,000 newsstands, supermarkets, drug and variety stores the brightly jacketed paper-bounds are making a robustly successful bid for a place in U.S. buying habits." 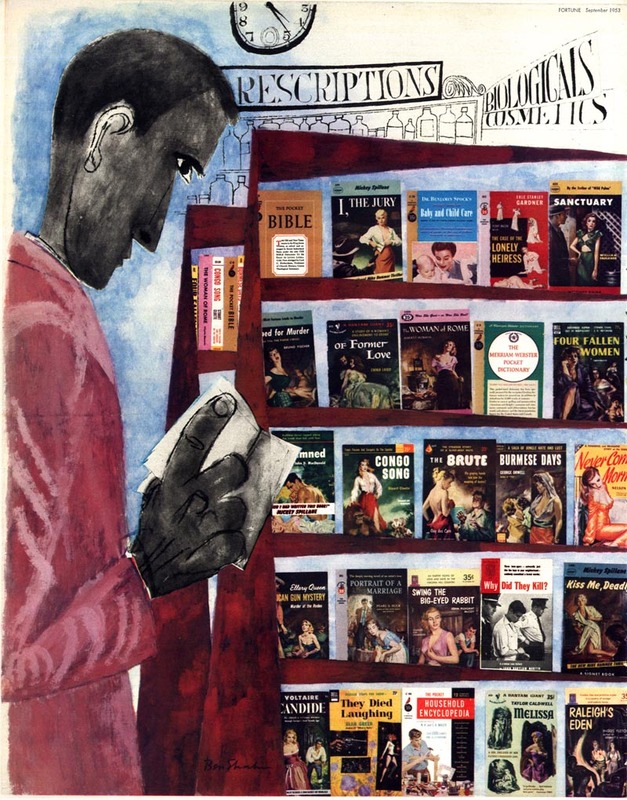 Interesting as a glance into an important moment in the history of the book publishing industry... but what is its relevance to us, as illustrators and enthusiasts of mid-century illustration? For one thing, its a way of hammering home the point that the advent of the 'paper-bound' presented illustrators with an unprecedented new market for their talents. All those covers needed artwork, and some of the most talented illustrators of the day stepped forward to stake out their territory. As well, it gives us an opportunity to reflect on the cyclical nature of this industry and how important it is for us to be aware of that dynamic. With the recent arrival of the Kindle and the iPad, do we find ourselves once more standing on the threshold of another revolution in the mass-marketing of the written word? And if so, how will that revolution impact us? Will we be ready to reap the rewards - as the illustrators of the mid-century were - or will we be further marginalized as many (myself included) feel we have been (especially in the last decade). The Fortune article describes an "overhauling [of] production, distribution, and merchandising of books" and how "paper-bound publishers have found gold in neglected markets." "It is a market that has shown both an unsurprising taste for titillation and a startling desire for information and 'culture'." Doesn't this all sound uncannily familiar? We've looked at paperback cover art before, but this time we'll delve a little deeper into the history, motivations and market statistics of the last great revolution in the mass-marketing of the printed word. It is my hope that in the process we'll gain a better understanding of where we've been and where we are going as graphic arts professionals. 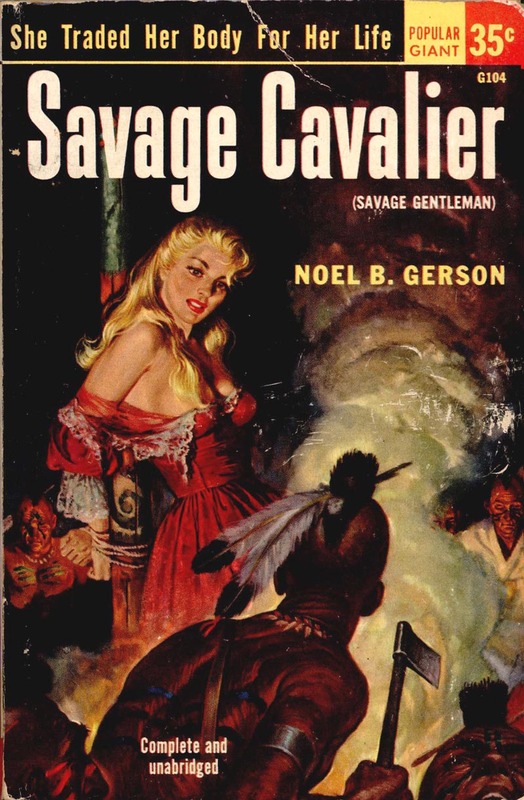 * Accompanying selected excerpts from the Fortune article will be a broad sampling of mid-century paperback cover scans generously provided by one of my contacts on Flickr, UK Vintage. Many thanks Uilke! *ALSO* Be sure to visit Female Illustrators of the Mid-20th Century for an important announcement of what sounds like a terrific exhibition coming up at Parson's that will include work by Lorraine Fox, Esta Nesbitt, and Andree Golbin. Don't forget the painting from Fortune at the beginning of the feature by the great Ben Shahn. Absolutely, Alex. What's kind of ironic is that Fortune's AD, Leo Lionni, used Ben Shahn to illustrate an article about a subject that is most identified by the most un-Ben Shahn-ish artwork you could imagine. But Lionni, who always used avant garde illustrators during his tenure at Fortune, later became an art director of paperback covers himself! You've hit on what is my personal sweet-spot of illustration. 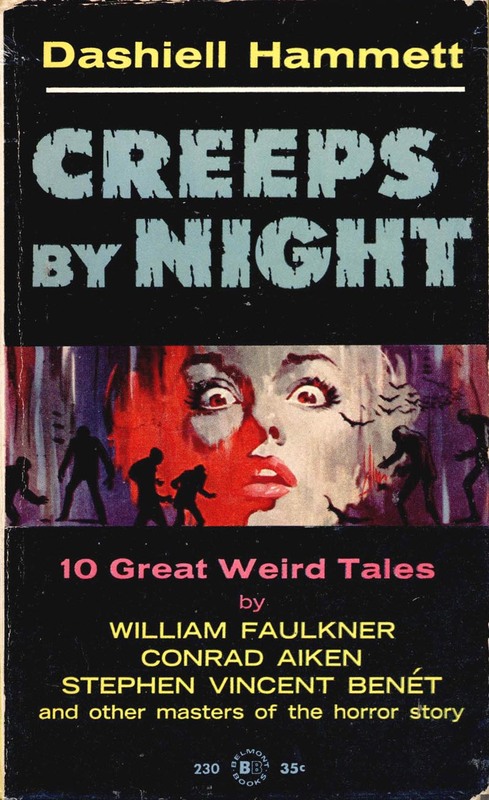 I could (and have) browsed covers like these all day. I'm looking very forward to reading and seeing more. Thanks! That Ben Shahn illo is great! I didn't know he ever did this kind of commercial work. Amazing to think back to a time when the paperback was the latest technological innovation! Maybe I'm just the pessimist but I can't see kindle et al becoming a boom area for illustration.But I'll close my eyes, cross my fingers and make my hardest wish for all of us. It's funny, but with generations of art students by-passing traditional skills we may eventually move back to a situation where the 'artist' is viewed as a kind of valued master craftsman as in earlier times. Sherm; Leo Lioni seems to have assigned quite a few jobs to Shahn ( and many other artists who were far from the mainstream ). I'll be featuring more of that work some time soon. Chad; At this juncture I'm inclined to agree with you - illustration doesn't seem terribly important to the next wave of technology... and that's what concerns me. Perhaps its too soon to say for sure... I hope that's the case. 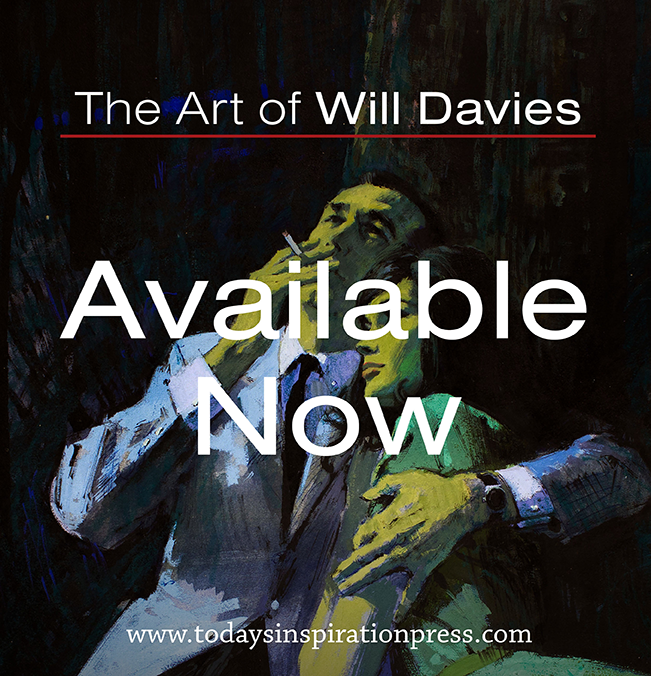 Based on what I know of the paperback industry as it started, if you look at the whole industry of book publishing, artists have rarely been given their due respect. 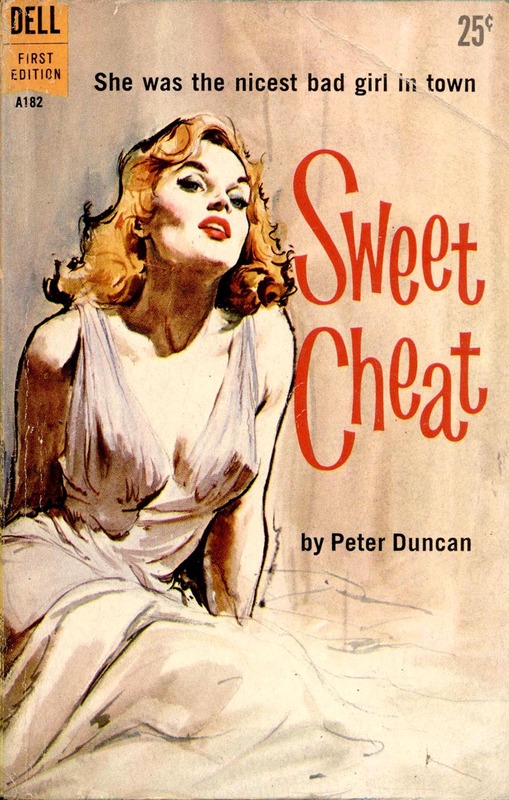 Pulp magazines and paperbacks were treated as disposable items and the cover artists suffered as a result. As you've shown here frequently, Leif, it's often difficult to find who did what. It's a stigma that's still enforced in digital press now by those who run the show. My hope is that the market will allow for independents to more easily participate, and that there will be enough financial benefit to make it worthwhile. A good parallel to this is to look at the music industry, and how digital downloads of songs are effecting or benfiting artists. 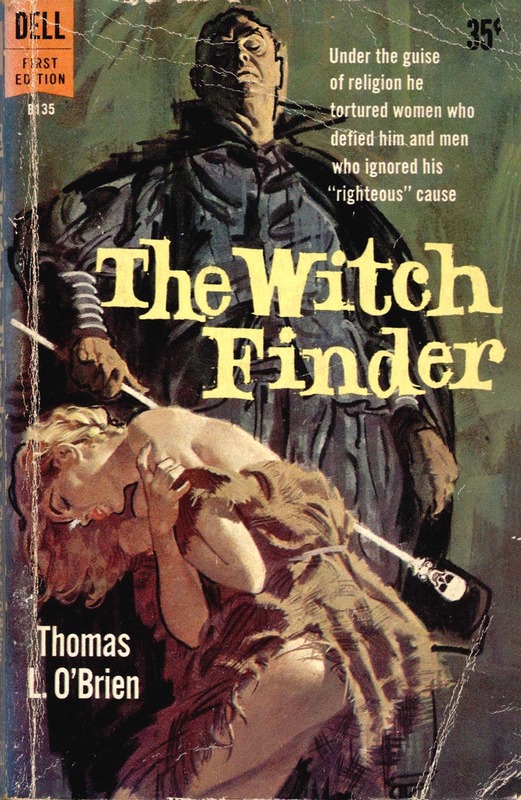 I actually have a copy of the Witch Finder! I found a dollar bin at a used bookstore and grabbed it! Thanks for the post!